I’ll never understand people who don’t like garlic. It’s an essential ingredient in so many cuisines, from Cajun to Italian to Thai. Sure, it makes your breath smell, but that’s what toothpaste and mouthwash are for, so why deny yourself the wonderful flavors of garlic? 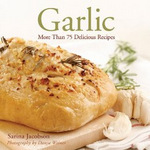 Though not a vegetarian cookbook, Sarina Jacobson’s Garlic includes plenty of excellent meat-free recipes, and many of the others can serve as inspiration for vegetarian adaptations. The book starts out with tips on buying, storing, and preparing garlic (as well as dealing with odor on your skin, cooking utensils, and breath). Recipes are divided into chapters: soups, salads and vegetables, breads and tarts, pastas and grains, meat, and condiments. Garlic bread soup is a delicious variation on French onion, while Roasted garlic and sweet potato soup and Garlicky pumpkin risotto are comfort food at its best. Garlic and (portobello) mushroom burgers are hearty and delicious. Choose between Garlic vinaigrette, Roasted garlic purée, Garlic sour cream sauce, and Garlic butter to add flavor to just about anything. All in all, there are dozens of recipes here for garlic-loving vegetarians. In addition, traditional recipes like Stir-fried beef and greens and Chicken and broccoli pasta bake can be adapted with mock meats like seitan or tofu. If you’re looking to spice up your cooking with more garlic, check out Garlic for some old favorites and lots of new ideas.